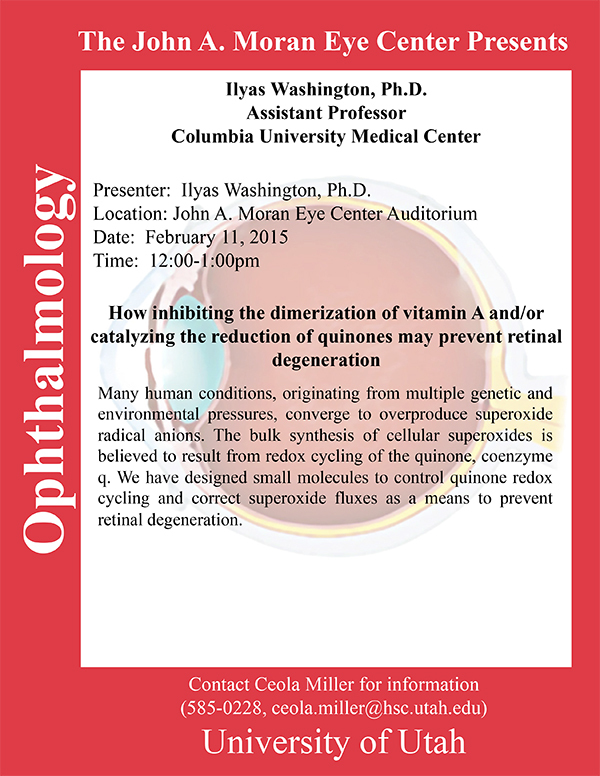 Ilyas Washington from Columbia University Medical Center will be delivering a seminar on How Inhibiting The Dimerization Of Vitamin A and/or Catalyzing The Reduction of Quinones May Prevent Retinal Degeneration on Wednesday, February 11th, 2015 in the Moran Eye Center auditorium. Abstract: Many human conditions, originating from multiple genetic and environmental pressures, converge to overproduce superoxide radical anions. The bulk synthesis of cellular superoxides is believed to result from redox cycling of the quinone, coenzyme q. We have designed small molecules to control quinone redox cycling and correct superoxide fluxes as a means to prevent retinal degeneration.